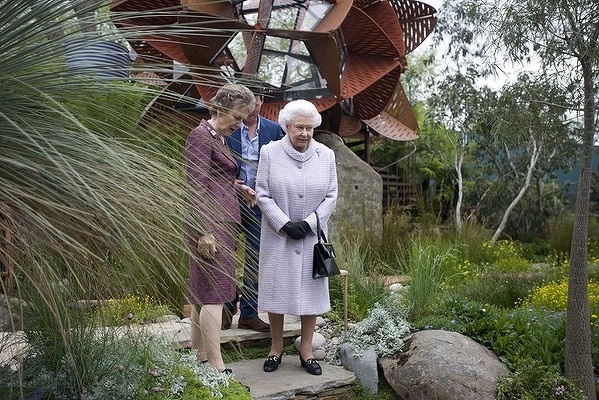 The Queen, visiting the top prize winning entry of the Australian ‘Trailfinders Gorge’ garden at this years’ Chelsea Flower Show in London in this, its centenary year. This was ninth time lucky for Wes Fleming (Flemings Nurseries) who with Melbourne garden designer Phillip Johnson came up with a billabong inspired landscape that reminded him of his childhood visits to the country – with rock gorge, gum trees, wildflowers, grasses and a 100 year old bottle tree (Brachychiton rupestris). They set out to showcase the possibilities of sustainable landscaping within an urban setting. 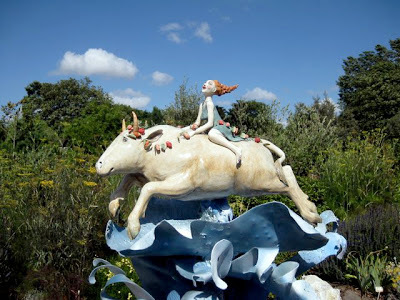 The billabong (small inland lake) and waterfall, that runs through the centre of the garden, was fed by water harvested from the roof of the BBC studio building and, wherever possible, they used recycled materials for the hard landscaping. The sculpture like structure in the background was inspired by the beautiful red flowering waratah and doubles as a studio. Why, you might ask, do I get excited by this and want to write an article about it? Isn’t it just a snobby kind of flower show for the Brits? Well no, not exactly. Although the majority of exhibitors at Chelsea have always been British, there has been an international contribution ever since the first show in 1913, when the French rose growers Robichon had a stand. For an Australian garden to win is truly a wonderful achievement – and anything that puts gardening ‘down under’ on top is pretty damn fine!. As Wes Fleming said ‘I feel like the Usain Bolt of the gardening world’. Cate Blanchett (the actor) summed it up well in a recent radio interview when she was being asked about the local and international success of the Sydney Theatre Company, where she has been Artistic Director along with her husband Andrew Upton, when they wowed audiences in New York and London with the plays ‘A Streetcar Named Desire’ and ‘Uncle Vanya’ – with very flattering critical acclaim. She agreed with the interviewer that Australia still seems to suffer from a certain amount of cultural cringe and Canberra (read decision makers) only seems to sit up and take notice when we have successes overseas. – only then does the funding start to flow a little more freely and more ambitious projects get the nod of approval. Maybe this will change when Australia becomes a republic and our head of state is not 17,000km in Buckingham Palace. The comedian Jerry Seinfeld made me cringe and laugh at the same time with this quote ‘I love the Australian flag – Britain at night’! So, if you are ever in London the last week in May – I highly recommend a visit. As one German visitor was heard to say: ‘This is the happiest day of my life’. 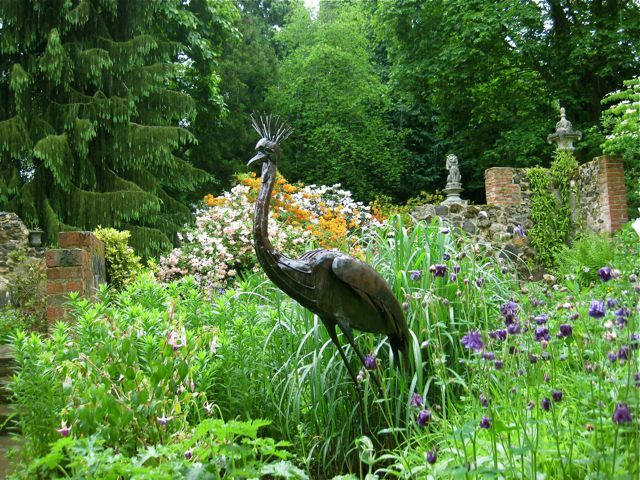 And, if you can’t get to Chelsea go to some the other magnificent gardens around England like Great Comp, Kent in the photo below or Great Dixter in Sussex – and be inspired. Little did my husband know that I had been to Lullingstone many times before when I was a child. 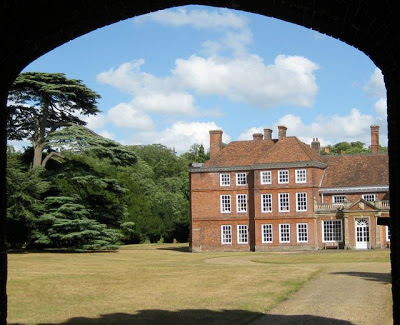 About 55 years ago my primary school teacher used to take us kids, from the smoggy old city of London, for walks in the country and we would end up at places like this (there’s also the remains of a Roman Villa nearby). 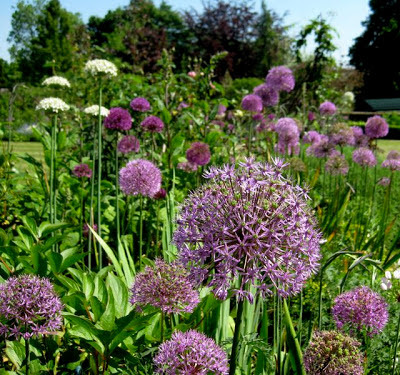 I am sure these magical days out with Mr Cramp through bluebell woods and across fields of wildflowers, helped to sow the seeds of my lifelong love of the natural world – and gardening! Being at Lullingstone after all that time was a very strange experience. But, there were more surprises in store.I also did not know that my husband is distantly (very distantly!) related to the Hart Dykes and he had a grand old time wandering around as if he was lord of the manor!! 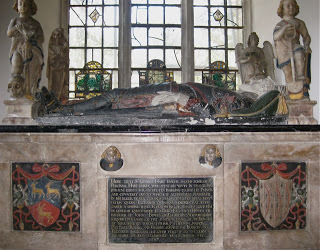 My husband especially wanted to show me this tomb in the chapel of Sir George Hart, knighted by Queen Elizabeth1 in 1587 – the chapel building pre-dating this period. So we start this post with the second Queen Elizabeth and end with the first! NOTE: The World Garden is laid out like a map of the globe and plants from every corner of it are planted where they were collected from – so as you walk around you are taken on a global botanical tour. It’s really well worth a visit. In 2000 Tom Hart Dyke was on an orchid hunting trip in Central America when he was taken hostage by guerrillas – they thought he was a CIA agent. In captivity he started to make a garden and was endlessly curious about the strange tropical plant world that he found himself in. He thinks that his constant gardening, during this time, and curiosity saved him – the guerrillas finally realised that he couldn’t possible be a spy because he was obviously just plain loopy!